FEMA building scientists have created a new series of Recovery advisories to show homeowners, contractors, builders and others techniques to make structures more wind and flood resistant. Damage to structures from hurricanes Maria and Irma could have been prevented or significantly reduced with different construction techniques. Applying the lessons and ideas in these advisories can help people and communities be better prepared for the next hurricanes, able to recover faster and at less expense. FEMA has prepared an Environmental Assessment (EA) to consider and assess the impacts of the proposed action on the human environment, to enable the public to understand the environmental consequences of these actions, and provide relevant comments. FEMA prepared this EA, in accordance with Section 102 of the National Environmental Policy Act (NEPA) of 1969, as amended; the Regulations for Implementation of the National Environmental Policy Act (40 Code of Federal Regulations [CFR] Parts 1500 to 1508); FEMA Directive 108-1; FEMA Instruction 108-1-1; and NEPA streamlined procedures. Applicants have a right to appeal any FEMA decision. Some survivors who registered for federal disaster assistance may have received a letter from the Federal Emergency Management Agency that says they are ineligible. The reason for the decision may be something that can be easily fixed, such as providing insurance documents or new contact information. You may not have signed essential documents. Read your letter carefully. FEMA may only need you to provide additional information. Your appeal should include new or missing information, documents and damage repair estimates that support the appeal request. If it isn’t clear, or more information is needed, a specialist at the FEMA helpline at 800-621-3362 (voice, 711, video relay service) can help. TTY users can call 800-462-7585. The toll-free lines are open 7 a.m. to 11 p.m. seven days a week. Appeals may also be faxed to: 1-800-827-8112, Attention: FEMA. You can also call the helpline at 800-621-FEMA (3362) or TTY 800-462-7585 or visit a Disaster Recovery Center, where you can talk with someone about your particular case. Everyone should read their letters carefully, ask questions, ask for help, and tell us if you think we got it wrong. We are here to serve you – the disaster survivor – and it is your right to ask us to reconsider our decision. The Territorial Government of the U.S. Virgin Islands and the Federal Emergency Management Agency offer the following tips to homeowners, renters and business owners while cleaning their property. Avoid debris, downed power lines, and flood water, which may be electrically charged and hide dangerous debris or places where the ground is washed away. Do not move or cut downed power or utility lines. You can help emergency workers by staying off the roads and out of the way as much as possible. Drive with care, especially at night. If your power is out, safely use a generator or battery-operated flashlights. Never use a generator inside a home, basement, shed or garage even if doors and windows are open. Keep generators outside and far away from windows, doors and vents. Read both the label on your generator and the owner's manual and follow the instructions. Avoid plugging emergency generators into electric outlets or hooking them directly to your home's electrical system – they can feed electricity back into the power lines, putting you and line workers in danger. Take photos of damage before you begin the clean-up process. Be sure to include photos or videos of the outside and inside of the building, including damaged personal property, and label them by room before you remove anything. If you have insurance, be sure to photograph the make, model and serial number for appliances such as washers, dryers, hot water heaters, kitchen appliances, TVs and computers. If you have insurance, separate damaged items from undamaged items. The insurance adjuster will need to document damaged items when conducting an inspection. If possible, keep samples of carpet, flooring, wallpaper, drapes, etc. Throw away flood-damaged items that pose a health risk. After taking photos, immediately throw away flood-damaged items that pose a health risk after coming into contact with flood waters, such as perishable food, clothing, cushions, mattresses and pillows. Always wear protective clothing. This includes long-sleeved shirts, long pants, rubber or plastic gloves and waterproof boots or shoes. Take wet items outside. Your home could be contaminated with mold, which may raise the health risk for those with asthma, allergies and breathing conditions. For detailed tips on cleaning mold safely, visit the Center for Disease Control’s site at https://www.cdc.gov/mold/cleanup.htm. Clean all hard surfaces and items with bleach. If possible, wash wet fabrics in hot water. Be aware of damaged power lines, gas lines and other structural damage. Inside and outside of building, watch for sharp objects such as protruding nails and screws, aluminum, and broken glass. Turn off main electrical power and water systems. Don’t use gas appliances until a professional can inspect them. Check all ceilings and floors for signs of sagging or other potentially dangerous structural damage. Remove all drywall and insulation that has been in contact with flood waters. Throw out any items that cannot be cleaned. This includes items like mattresses, carpeting, stuffed animals that absorb water and cannot be cleaned or disinfected. If you have insurance, contact your insurance agent to report your damage from the hurricane and file a claim as soon as possible. Your insurance agent can walk you through your options. Make sure to photograph the damage for documentation purposes. Follow us on Facebook to receive timely USVI hurricanes Irma and Maria recovery updates, information and resources. Rumor: It’s difficult to get updates about the status of applications for low-interest disaster loans from the U.S. Small Business Administration (SBA). Fact: Survivors may contact SBA at any time with questions about their application. They may call the SBA Customer Service Center at 800-659-2955 or TTY 800-877-8339. They may also send an email requesting updated information to disastercustomerservice@sba.gov. SBA loan specialists are also available to assist survivors at Disaster Recovery Centers throughout the territory. Rumor: It isn’t necessary to fill out an SBA disaster loan application if you do not want a loan. Fact: FEMA urges survivors to complete and return the SBA loan application if one is offered. Survivors should know they do not have to accept a loan. However, if they complete and return the application and do not qualify for a loan, SBA will refer them back to FEMA and they could be considered for other FEMA grants for Other Needs Assistance (ONA). This assistance covers disaster-related car repairs, clothing, household items and other items. Survivors cannot be considered for these ONA grants unless they complete and return the SBA loan application. Rumor: FEMA employees earn a commission for each disaster survivor they register for assistance. Fact: FEMA staff neither charge a fee nor earn a commission for registering survivors. Because ongoing communications challenges in the U.S. Virgin Islands make it difficult for survivors to register online or call our registration hotline, FEMA staff are out in communities across the islands to help with registrations. We want to ensure every survivor has an opportunity to register with FEMA before the January 8th, 2018 deadline. Rumor: The deadline is approaching to register with FEMA for disaster assistance. Fact: FEMA has extended the registration deadline for both disaster to January 8th, 2018 to ensure all survivors of hurricanes Irma and Maria have an opportunity to register for assistance. Survivors without connectivity may stop in at any of the nine Disaster Recovery Centers across the territory to register for assistance and learn about the federal assistance programs that are available to them. Rumor: FEMA Housing Inspectors are not contacting survivors, and they are not visiting homes that are insured. Fact: Housing inspectors are making every effort to contact survivors to schedule a housing inspection. As of 11/9/17, almost 11,000 housing inspections have been completed territory wide. Ongoing communications challenges throughout the Virgin Islands have made it difficult in some cases for FEMA’s housing inspectors to reach survivors to verify damages to their homes. To help make the connection, survivors who have not yet heard from a housing inspector may visit any Disaster Recovery Centers throughout the territory to obtain the name and phone number of the housing inspector assigned to them. Inspections are being conducted regardless of whether the home is insured. FEMA doesn’t duplicate insurance payments, but applicants who are under-insured may be eligible for some assistance. Rumor: Survivors living in rental units damaged by the hurricane cannot get FEMA assistance. And anyway, property management companies will pay for damaged contents. Fact: Renters whose homes were made uninhabitable by a disaster may be eligible for FEMA disaster grants, rental assistance and other disaster-related needs. If you are a renter you should register with FEMA to see whether we can help. Do not assume your personal property damages will be covered by your property management company, though you may be covered if you have renter’s insurance through a private company. Rumor: Survivors should not clean-up their homes before the FEMA housing inspector visits. Fact: Survivors are encouraged to clean up their homes and businesses as soon as possible. This will not affect their eligibility for assistance. Save your repair receipts. You may take pictures of the damage for your records, though FEMA does not require them for an inspection, and will not reimburse you for photo supplies. Rumor: FEMA is providing only $500 to survivors and then sending them to the U.S. Small Business Administration for a loan. Fact: Because of the unique situation in the Virgin Islands, FEMA is providing $500 in Critical Needs Assistance to eligible applicants who have immediate or critical needs. Survivors may also be eligible for FEMA assistance for emergency home repairs, uninsured personal property losses and other expenses caused by the disaster. You should complete and return the SBA loan application if one is provided, as a loan may help you more fully repair and rebuild your home. You do not need to accept a loan, but if you are not approved for the loan you may be eligible for additional assistance from FEMA. Rumor: Survivors automatically receive $500 when they register for assistance with FEMA. Fact: FEMA does not provide money upon registration. However, because of the unique situation in the Virgin Islands, additional assistance may be available to applicants for Critical Needs Assistance that have immediate or critical needs due to displacement from their primary dwelling. FEMA provides this assistance on a case-by-case basis depending on the need. There are other ways to help. When disaster strikes, America looks to FEMA to support survivors and first responders in communities all across the country. We are currently seeking talented and hard-working people to help support the response and recovery. Talk about the concerns about the storm with your children. To not talk about it makes it even more threatening in your children's mind. Start by asking what your children have already heard and what understanding they have. As your children explain, listen for misinformation, misconceptions, and underlying fears or concerns, and then address these. Explain - as simply and directly as possible - what is happening or likely to happen. The amount of information that will be helpful to children depends on their age and developmental level, as well as their coping style. For example, older children generally want and will benefit from more detailed information than younger children. Because every child is different, take cues from your own children as to how much information to provide. Encourage your children to ask questions, and answer those questions directly. Like adults, children are better able to cope with a crisis if they feel they understand it. Question-and-answer exchanges help to ensure ongoing support as your children begin to understand the crisis and the response to it. Limit television viewing of disasters and other crisis events, especially for younger children. Consider coverage on all media, including the internet and social media. When older children watch television, try to watch with them and use the opportunity to discuss what is being seen and how it makes you and your children feel. Reassure children of the steps that are being taken to keep them safe. Disasters and other crises remind us that we are never completely safe from harm. Now more than ever it is important to reassure children that, in reality, they should feel safe in their schools, homes, and communities. Consider sharing your feelings about a crisis with your children. This is an opportunity for you to role model how to cope and how to plan for the future. Before you reach out, however, be sure that you are able to express a positive or hopeful plan. Help your children to identify concrete actions they can take to help those affected by recent events. Rather than focus on what could have been done to prevent a disaster or other crisis, concentrate on what can be done now to help those affected by the event. Play games and do activities together to create meaningful dialogue and offer a distraction. If you have concerns about your children's behavior, contact your children's pediatrician, other primary care provider, or a qualified mental health professional. All federal actions, including FEMA’s actions to support response to and recovery from disasters, must comply with applicable federal statutes, regulations, and Executive Orders enacted to protect and conserve environmental, historic, and cultural resources. For more information visit https://www.fema.gov/office-environmental-planning-and-historic-preservation. In light of the unprecedented demands of the 2017 Hurricane season, FEMA is adopting streamlined public communication procedures for environmental assessments for hurricanes Harvey, Irma, Maria, and Nate. These streamlined procedures involve public notice through FEMA’s disaster websites and social media. For more information, see https://www.fema.gov/fema-national-environmental-policy-act-streamlined-procedures. 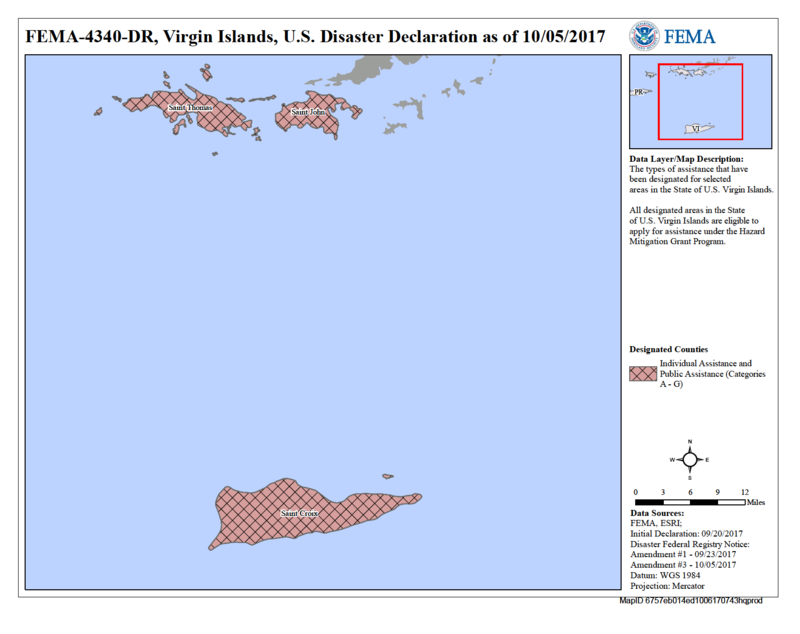 FEMA will post links to environmental assessments and associated documents that pertain to FEMA’s actions in U.S. Virgin Islands here as they become available for public review and comment. The comment period for this EA is open from February 27 to March 4, 2018. FEMA invites the public to submit written comments by emailing femar2comment@fema.dhs.gov.